Although a few lucky Nexus 6P buyers have been notified that their phone started shipping last week, things aren't that great for other customers. It turns out that Google doesn't have enough Nexus 6P units to send to all those who've pre-ordered the handset from Google Store in the US. Thus, the company began sending emails to inform some customers that shipments have been delayed until the first half of November. Google says that it's working "to meet the strong demand" for various Nexus 6P models, though it's not clear exactly what color variants and memory options are affected by the stock shortage. On a more positive note, Google is offering $25 refunds to customers who are receiving emails announcing the delay. In addition to being available from Google Store, the Nexus 6P can also be pre-ordered from Huawei's official US website. However, Huawei (which is the manufacturer of the device) says that it can't ship the 6P before late November. So Google Store remains the better option, assuming you want to get a Nexus 6P as fast as possible. The Nexus 6P is one of the world's first devices to run Android 6.0 Marshmallow out of the box (alongside the LG-made Nexus 5X). Prices for the handset, which is being sold only unlocked, start at $499. For more about the new Google smartphone, check out our Nexus 6P review. Mine should be here tomorrow. Which one did you order? You guys are pathetic. lol Nexus with "pure android"(boring BS) could never compete with real flagship phones like GalaxyS or Note. Period. If you come from iOS it makes more sense, though. Nexus is simple and featureless, the way you use to, iboys. Kid, Nexus is the land of tinkering. Nexus is where geeks who can't develop their own ROM but are ready/able to try other people developments through rooting, flashing(ROM, kernel, radio, etc. ), Xposed Framework go. We Nexusians have the same opinion about you, average boring Joes who let other OEMs tinker their Android for them. P.S. Unfortunately Google is making this harder recently. Enough with the disrespect. If people want a phone with stock android then let them. No need to be a douche about it. don't clutter the comment section please. He's cluttering earth and the gene pool with his existence is the problem. Bro, get the 6p. You'll love it. iSamsungPhanboy in action, to help his religion with all possible methods. Right? 6P is a no brainer for me. Shut up! You're not helping the demand issue. Not feeling the Nexus 5x? I quite like it so far. Not as freaking nice as my GS6 but nothing besides the Note 5 is. Just keep it. Eh... the design just feels a bit off to me... The speakers are too far off the screen instead of being centered in the middle of the bezels... The screen itself is off-center JUST enough to be annoying... The haptic-feedback feels hollow and makes a weirdly-loud sound... The side-buttons are wobbly... I dunno, it just seems like they cut a few corners this time that they didn't cut with the original N5. The first one just felt more solid, especially for the time. It's a good phone, don't get me wrong (I think I rated it an 8.5 or thereabouts), but if I can spend my money on a better one I definitely will. I'm not saying the Robin will necessarily be without flaw, but it at least it looks better than the 5X. 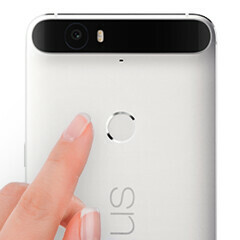 The buttons seem okay to me, less wobbly than the ceramic Nexus 5 ones. But yeah they obviously cut some corners. Does plugging in the type C port feel absolutely horrible on yours? Like it's not that right fit and you have to push really hard to plug and unplug it? Should have kept wireless charging. Despite that it's a great phone. I thought the size compared to other phones would bother me more but it doesn't. Finally something to compete with iPhone demand. Google is really pathetic when it comes to keeping a new device in stock. This is ridiculous. Really? What about Apple? Oh wait... I have one better. How many phones you think an OEM can have built in a month using someone else assembly plant? Who also assembles phones for other oems? Assuming most oems can make maybe 3M phones in a months time, it is easy for any of them to be overwhelmed by orders. Saying Google.isnpathetic makes you.pathetic. Considering Apples for example.knkws how big their demand is, why can't they have 10M phones available for release day? Why is it when in pre-order phones for our usual upgrade at the office, it took 83 weeks for some to marriage even though all.15 were ordered at the same time? Yea, that's pathetic for a $200BN company. Oh and consider, Samsung sells 300M phones in a year and the only time you hear of a shortage is if their is component supplybissues, or in the case of the St Edgw, received unexpected demand and it had glass supply issues. Justbsaying...Apple.is short every year and knows their demand and never meets it and yet I have never seen you call them pathetic. So... you're saying Samsung never has supply issues except for when they have supply issues...? Why do you HAVE TO bring apple and the iphone into every gaddamn phone related article? You are not the biggest fan of Apple and their products. I get it. Neither am I. But it is getting pretty sickening to try and read through the comment section of any article on this site without your several comments that are longer than the original article. This article is about the Nexus 6P dammit. Don't drag apple into it.. or for that matter Samsung, LG or any other unrelated party. You claim to stand against all of Apple's evils. But sorry to say.. you are their biggest PR asset on this site because you inevitable bring their name into it and give them free publicity. Get a phone that you like and enjoy it. Let other people enjoy their phones. And do you really have so much time to just keep typing lengthy comments on phonearena? Damn dude, roasted his arse. Nice, well said, now take your belt off and_________. Every article he has to write an article for the local paper. How long before you think you'll be able to buy the model you want? I've read that they're going to be available again around mid November. I'm going for the 128GB frost model. I really do wish that they would increase production already. Well....so they sold though the first 1000 phones. Who would have ever guessed the demand would be soo high! *rolls eyes* This happens every year. If they would make more then 1000 phones they wouldn't sell out so quickly. You cant tell me they have sold a ton of these 6p's! The only people that really know about these nexiis are forum dwellers. They seriously just barely made any just to see what the initial demand was via pre-order was. I'm not an android hater. I'm just wanting these to come in Stock so I can order one! Black 64gb....Likely the highest demanded one. do you drive a black jeep srt8?